Russia, a leading oil and gas exporter, has used more than 50% of its known oil reserves and might need to attract enormous investment to modernise its oil infrastructure. In the global energy market, rapidly changing due to a number of factors, such as the rise of Brazil and the shale gas revolution, Russia has been doing well so far, even beating Saudi Arabia to the title of the world's biggest oil producer, according to some estimates. But Russian Prime Minister Vladimir Putin has said that the country's oil industry would need more than 8.6 trillion roubles ($280bn; £180bn) of investment during the next 10 years. Otherwise, it is estimated, oil extraction levels in Russia could fall 20% by 2020. "It is important we create conditions for investment growth in technical upgrades of the fuel and energy system, and stimulate fuel companies to use new technologies which can provide greater returns in oil and gas production," Russian President Dmitry Medvedev told the country's Security Council earlier this week. Both officials and ecologists have been saying that many Russian oil and gas pipelines and refineries are either reaching the end of their serviceable life or have even surpassed the mark, while ageing oil fields make companies think of how much it could cost to discover new ones. Could this situation put Russia in danger of losing a significant chunk of the global energy market? The importance of serviceable life data must not be over-estimated, according to Anatoly Dmitrievsky, director of the Oil and Gas Research Institute of the Russian Academy of Sciences. He told the BBC that the Russian norms regulating depreciation periods were much stricter than the ones in the west. He added that while more than 50% of Russia's known oil reserves had indeed been extracted, "we still have not found about 60% of oil reserves in Russia, and have discovered only 25% of gas reserves". According to the government's estimates, Russia's known gas reserves stand at 165 trillion cubic metres. Elena Anankina, credit analyst at Standard & Poor's, says that many Russian oil companies have oil reserves that will last 20 years, which is longer than what their western rivals have. Mark Spelman, head of strategy at the technology consulting firm Accenture, believes that there is no long-term risk of Russia losing its position as a leading exporter of oil and gas. Many experts point out that most challenges Russia is facing are not unique, as a number of other oil producers have seen a decline in output or require large investment. For example, says Mr Spelman, while Brazil has got significant oil reserves, many of them are offshore, and there could be a long delay in exploring them due to the Gulf of Mexico oil spill earlier this year. But there is no denial that the Russian oil and gas industries are in clear need of modernisation. According to the Kremlin documents, quoted by the Russian news agency RIA Novosti, 80% of the oil refining industry's infrastructure is worn out. 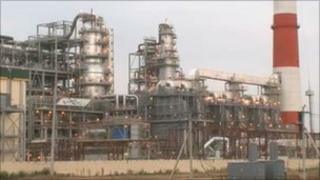 The situation in the gas and electricity industries is said to be only a little bit better. But Mr Dmitrievsky says that when talking about the need to modernise the oil refining industry, experts and officials often mean a gradual replacement of old technologies with new ones, rather than a need to fix worn out parts of the system. Many refineries, he argues, were built in the 1950s-1960s, and the cheapest and simplest technology was used to refine oil. No surprise, then, that 40% of all refined products produced in Russia are heavy products, such as fuel oil, according to Ms Anankina. She says that most Russian refineries do not have the necessary equipment to produce a lighter product mix and, compared to international peers, have a higher share of cheaper fuel oil and a lower share of expensive petrol. Russia Business Report is a television programme for BBC World News. Every month we take a look at the latest trends in the Russian economy and business world. Watch the next programme on Saturday, 25 December at 0430 GMT and 1730 GMT and on Sunday, 26 December at 1030 GMT and 2330 GMT. The paradox, though, is that while Russian heavy products are cheaper than the oil they are produced from, it is economically viable to sell them abroad. The answer lies in the Russian system of export duties: they are almost twice as high for oil than for oil products, Ms Anankina explains. "We are talking about some artificial profits here, i.e. profits created by the peculiarity of the tax system," she says. High taxes also often discourage companies from investing in new oil fields, while many existing ones have been providing less and less oil. The government seems to have recognised the problem, as it has been working on changing the tax system, hoping to give a boost to the modernisation process. In order to succeed in upgrading its existing energy infrastructure and exploring its offshore and onshore fields, Russia will need some expertise and support from the west, says Mr Spelman. He believes that Russia is "extremely pragmatic" and the government understands the need to attract foreigners to its oil and gas sectors. In turn, Mr Dmitrievsky suggests that while Russia has enormous scientific potential in the energy sector, there is something else that might be missing. "Do we need brains? Yes. But we need practitioners more," he says. He compared this situation to Russia's car industry, where the same models have been slightly modified and produced for decades, because of inability to replace assembly lines with ones capable of producing newer models. Mr Dmitrievsky believes that attracting money is important, but the main task is to attract some technologies that could help Russia retain its leading position in the global oil and gas market. It will soon become clear whether the government shares this view. Head of Russia's Security Council, Nikolai Patrushev, has said that Russia's new energy security doctrine will be drawn next year.